PPPL collaborations have been instrumental in developing a system to suppress instabilities that could degrade the performance of a fusion plasma. 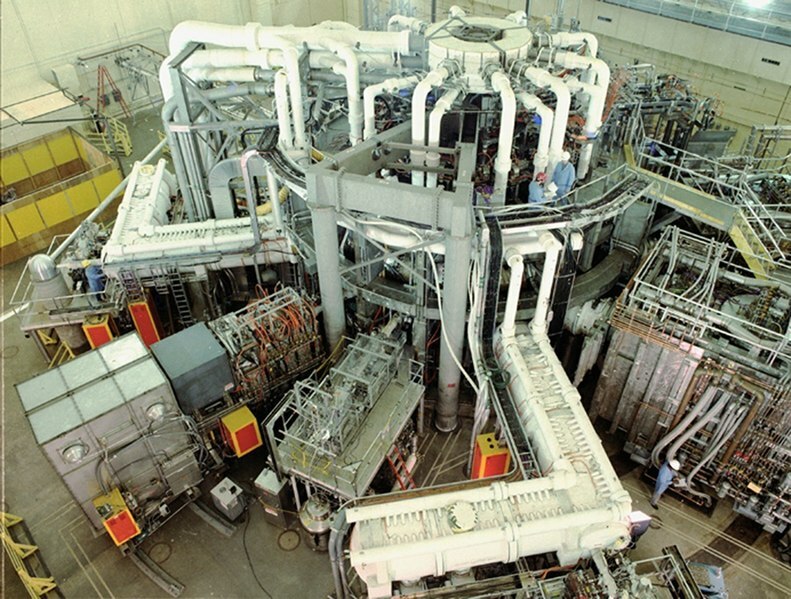 PPPL has built and installed such a system on the DIII-D tokamak that General Atomics operates for the U.S. Department of Energy in San Diego and on the Korea Superconducting Tokamak Advanced Research (KSTAR) facility in South Korea — and now is revising the KSTAR design to operate during extended plasma experiments. Suppressing instabilities will be vital for future fusion facilities such as ITER, the huge international project under construction in France. The system developed on DIII-D and then installed on KSTAR aims high-power microwave beams at instabilities called islands and generates electrical current that eliminates the islands. The process links software-controlled mirrors to detection equipment, creating a system that can respond to instabilities and suppress them within milliseconds. “It works like a scalpel that removes the island,” said PPPL physicist Raffi Nazikian, the head of the Laboratory’s collaboration with DIII-D.
Revising the unit on KSTAR calls for adding a water-cooling system to keep the mirrors that direct the high-power microwaves into the plasma from overheating. KSTAR’s superconducting magnets can confine the plasma for up to 300 seconds during long-pulse experiments that reach temperatures far hotter than the 15-million degree Celsius core of the sun. “Once you get beyond 10 seconds you have to remove the heat as you put it in,” said PPPL engineer Robert Ellis, who designed the copper and copper-and-steel mirrors. Ellis was part of a team of PPPL physicists and engineers who worked closely with their counterparts at General Atomics to develop the original system on DIII-D. PPPL Physicist Egemen Kolemen, an expert in plasma control, created much of the software that automatically steers the mirrors and directs the microwave beams to their target. PPPL engineer Alexander Nagy also shared responsibility for the system, providing onsite support in San Diego. The revised KSTAR unit will extend such research to long-pulse plasma experiments when work on the water-cooled mirrors is completed later this year. Tensions rose in the U.S. Department of Energy’s (DOE) Princeton Plasma Physics Laboratory (PPPL) as the seconds counted down. At stake was the first crucial test of a high-powered mixture of fuel for producing fusion energy. As the control-room clock reached “zero,” a flash of light on a closed-circuit television monitor marked a historic achievement: A world-record burst of more than 3 million watts of fusion energy — enough to momentarily light some 3,000 homes — fueled by the new high-powered mixture. The time was 11:08 p.m. on Thursday, Dec. 9, 1993. “There was a tremendous amount of cheering and clapping,” recalled PPPL physicist Rich Hawryluk, who headed the Tokamak Fusion Test Reactor (TFTR), the huge magnetic fusion facility — or tokamak — that produced the historic power. “People had been on pins and needles for a long time and finally it all came together.” It did so again the very next day when TFTR shattered the mark by creating more than six million watts of fusion energy. Leaders of this effort included Jerry Levine, now head of the Environment, Safety, Health & Security Department at PPPL, and John DeLooper, who heads the Best Practices and Outreach Department. Levine’s team launched an environmental assessment under the National Environmental Policy Act in 1989 and received DOE and state approval in 1992. “The purpose was to show that there would be no significant environmental impact as a result of tritium operations,” Levine noted. DeLooper’s team double-checked everything from operator training to preparations for storing and moving the tritium gas, which subsequently arrived in stainless steel containers from the Savannah River National Laboratory in South Carolina. In the towering TFTR test cell, engineers readied the three-story high, 695-ton tokamak to operate with tritium. Key tasks included adding more shielding, checking all major systems against possible failures and ensuring that every diagnostic device worked. “The major challenge was to bring everything on line so that failures didn’t happen,” said Mike Williams, the head of engineering at PPPL and also deputy head of TFTR at the time. Keeping the local community informed was another high-priority. PPPL leaders held open houses, met with local executives and government officials and conducted two public hearings before the arrival of tritium. Attendees at one hearing included a local college class that arrived at the urging of its professor. By the day of December 9, press coverage and Laboratory outreach had made PPPL a focus of attention. “Scientists from around the world flew in to witness the experiment,” recalled Rich Hawryluk. More than 100 local visitors flocked to the PPPL auditorium, where a closed-circuit TV feed displayed the control room and Ron Davidson and Dale Meade briefed the audience on unfolding developments. PPPL staffers and their families crowded around the viewing area that overlooked the control room. Reporters from several major newspapers covered the event. Also there was Mark Levenson, a reporter from New Jersey public TV station NJN whom the Lab hired to produce a video that subsequently received worldwide exposure. The source of all this excitement was surprisingly small: Just six-millionths of a gram of tritium was consumed that night in the shot that made global news. “Such tiny amounts generate huge energy because of the formula E = mc2” explained Charles Gentile, the head of tritium systems at PPPL. The celebrated Einstein equation states that the amount of energy in a body equals the mass of that body times the speed of light squared — an enormous number since light travels at 186,000 miles per second. Also anxiously waiting were more than 100 scientists, engineers and invited guests inside the control room, which normally held about 40 people. All sported red passes that the Laboratory gave to PPPL staffers and guests from DOE and institutions that collaborated on TFTR. “Everybody who could be in there was in there,” recalled Forrest Jobes, a now-retired physicist who kept those in the rear of the L-shaped room abreast of what was happening. But there still was plenty of waiting while a series of hardware glitches dragged out the schedule. “Many people in the audience thought we were doing this intentionally to increase the suspense,” Meade recalled. By 11 p.m. the problems were solved — setting the stage for the record-breaking shot at 11:08 signaled by the brightly lit light bulb and “Fusion Power” sign on the TV monitor. The control room erupted in jubilation over the shot, which produced 3.8 million watts of power. The excitement reached even the normally staid control-room log, where an operator noted the historic event with the exclamation, “EEYAH”! On that high note the experiments ended and the control room opened for press interviews. NJN reporter Levenson returned to his studio to assemble a video news release that he uploaded to a satellite for worldwide distribution, sending the piece off at about 4 a.m. Key parts of the footage — including the control-room jubilation — were shown on nationwide newscasts the following evening. First reporting the results was a paper published online in the November issue of the journal Nature Physics. U.S co-authors included PPPL physicists Jon Menard and Rajesh Maingi, who headed the wall-conditioning effort, and General Atomics physicist Gary Jackson, a plasma-control expert who helped draft the paper. The findings could hold particular promise for developers of future fusion facilities such as ITER, the international experiment under construction in France. Controlling instabilities that erupt at the edge of the plasma will be crucial to the success of the huge donut-shaped ITER tokamak, which is designed to demonstrate the feasibility of fusion power. The EAST experiments set a record for the duration of what is called an H-mode, or high-confinement plasma — the type that will be employed in ITER and other future tokamaks. To achieve this duration, the EAST team beamed what are known as “lower hybrid wave current drive” microwaves into the plasma. The antenna-launched beams reshaped the magnetic field lines confining the plasma and suppressed instabilities at the edge of the gas near the interior walls of the tokamak. Controlling these fast-growing instabilities, called “edge localized modes” (ELMs), produced a record life span of more than 30 seconds for the H-mode plasma. These results suggested a potent new method for suppressing ELMS to create an extended, or long-pulse, plasma. Many methods already exist. Among them are the use of external magnetic coils to alter the field lines that enclose the plasma, and the injection of pellets of deuterium fuel into the plasma during experiments. Contributing to the EAST results was the PPPL-designed wall treatment, which coated the plasma-facing walls of the tokamak with the metal lithium and inserted lithium granules into experiments to keep the coating fresh. The silvery metal absorbed stray plasma particles and kept impurities from entering the core of the plasma and halting fusion reactions. “When lithium has been used to coat the walls of fusion devices, higher plasma temperature, pressure, and confinement have been achieved,” PPPL physicists Menard and Maingi said in an interview. “This was good physics,” Jackson of General Atomics said of the experiments, noting that long-pulse plasmas will be required for fusion power plants to generate electricity. “The U.S. Department of Energy’s Princeton Plasma Physics Laboratory (PPPL) has joined forces with researchers in South Korea to develop a conceptual design for a pioneering fusion facility in that Asian nation. The proposed device, called K-DEMO, could be completed in the mid-to-late 2030s as the final step before construction of a commercial fusion power plant that would produce clean and abundant energy for generating electricity. South Korea’s National Fusion Research Institute (NFRI) will fund PPPL’s initial collaboration, which will run for six months, beginning in January, and could be extended. PPPL will explore cutting-edge designs and technologies that could benefit the U.S. fusion program, and South Korea will gain access to the Laboratory’s deep experience in designing and engineering fusion facilities. These include the National Spherical Torus Experiment (NSTX), PPPL’s leading fusion experiment, which is undergoing a major upgrade. K-DEMO will be comparable in size to ITER, a seven-story tokamak that the European Union, the United States, South Korea and four other nations are building in Cadarache, France. ITER is to produce 500 million watts of fusion power for 500 seconds by the late 2020s to showcase the feasibility of fusion energy. K-DEMO, by contrast, is to produce some 1 billion watts of power for several weeks on end. “K-DEMO should be just a small step away from a commercial plant in technology and performance,” said Neilson. Iter paints a bigger picture, but K-Demo has a much larger goal. See the full PPPL article here. “The latest advances in plasma physics were the focus of more than 1,000 scientists from around the world who gathered in Providence, R.I., from Oct. 29 through Nov. 2 for the 54th Annual Meeting of the American Physical Society’s Division of Plasma Physics (APS-DPP). Papers, posters and presentations ranged from fusion plasma discoveries applicable to ITER, to research on 3D magnetic fields and antimatter. In all, more than 1,800 papers were discussed during the week-long event. Members of the Laboratory’s National Spherical Torus Experiment Upgrade (NSTX-U) team gave a tutorial and three invited talks. Physicist Dennis Mueller presented the tutorial on Physics of Tokamak Plasma Start-up.